Seattle’s legacy of student-led resistance. Last week in Seattle, local teens were busy organizing a “March For Our Lives” sister march to call on politicians to change laws to improve school safety, stop mass shootings and end gun violence. Young people leading movements isn’t new. In fact, back in May of 1970, I arrived in Seattle to 6,000 students occupying I-5 in protest of the National Guard killing four Kent State University students who were protesting themselves. The most famous leaders of the Seattle Liberation Front movement were called the “Seattle Seven.” It was a group of collective households around the city who were organizing. They focused on everything from writing a statewide tax reform referendum on distributing doughnuts and coffee to people standing in line at the unemployment office to leading mass antiwar street demonstrations. At the time I had relocated from Berkeley, and I thought Seattle would be boring. I was wrong. And that was largely due to this movement. Kit Bakke’s new book “Protest on Trial: The Seattle 7 Conspiracy” eloquently portrays what worked in Seattle during the Nixon years — a similar reactionary period to today’s Trump’s administration — can work now. It’s a story of the amazing success of a handful of youths who gave birth to an energized and effective grassroots movement in Seattle to resist a reactionary government trying to undermine democracy. NL: Kit why is your book important today? KB: Currently, there is an overwhelming attack on our nation’s values of justice, equality and government accountability. I show how the tactics that were employed by college-age youths were able to meet that challenge in the early 70’s and how they can be applied today to counter the attacks upon our democracy today. You must have a growing movement that reaches out to everyone, people of all colors, ages, and occupations. The Seattle 7 and the movement they created, the Seattle Liberation Front, deployed multiple, layered tactics on many fronts. NL: How did they do that? KB: They generated a culture of protest and activism by engaging in community projects and having fun. They organized in taverns, they hosted lots of parties in homes, and popular music was always present. Consider how rap music in the play Hamilton has brought together a great diversity of Americans to enjoy its political message. Music and culture, in general, energizes a movement. NL: What did they actually do, besides organizing demonstrations? KB: Well, they were very good at organizing protests. A month after arriving in Seattle they gathered a couple of thousand demonstrators at Seattle’s Federal Court House. They were protesting a Federal Judge’s decision to jail a nationally known group of leftist organizers called the Chicago 7 for criminal contempt related to their trial for conspiring with “intent to riot” during the 1968 Democratic Convention. The same conspiracy charge was later brought against the Seattle 7. The energy generated by the SLF went far beyond protesting the Viet Nam War. They helped in founding community-based service organizations like the Country Doctor Clinic, the Northwest Immigrant Rights Project, and the Capitol Hill Food Coop, all of which are still serving Seattle residents. NL: Who were the Seattle 7? KB: The Seattle 7 consisted of one woman, Susan Stern, who was the only one who had attended the University Washington and six males. Michael Lerner, an assistant professor in philosophy at the U.W. was the oldest, the other five were college graduates or dropouts: Jeff Dowd, Joe Kelly, Michael Abeles, Roger Lippman and Charles (Chip) Marshall III. All had been active in Students for a Democratic Society (SDS), which was the largest student political organization in the nation at that time. SDS advocated “participatory democracy” where citizens could actually take part in the political decision-making process. In just a few weeks after arriving in Seattle, they created the SLF. Its key unit of organizing was young people living in rented homes they called political collectives. Each one took on a community-organizing project. Chip Marshall said they pushed lifestyle and music; everything focused on appealing to the masses and youths in particular, including black student groups. Basically, the SLF was a crowd-sourced revolution. Watching FBI agents recognized SLF’s uniqueness and noted in a concerned memo to their superiors that SLF had created a “strange new unity” unlike the disarray among activists in most other cities at the time. NL: Why were Feds so eager to bring them to trial? KB: After organizing a demonstration that resulted in damage to Seattle’s Federal Court House and the arrest of a number of demonstrators, the federal government came after them. But there were similar demonstrations around the country, some bigger and even more violent. I initially was interested in looking at 7 trial as a local history. However, I realized it was much more after I spent six years reviewing thousands of federal and court documents, FOIA files, and diving into special collections in several academic libraries in addition to conducting dozens of personal interviews. SLF’s efforts definitely caught the eye of the FBI more than other student-based activist groups, partly for its successes, and partly for being far from the media and political power centers of the country. It appears that the Nixon Administration’s Justice Department and the FBI choose to prosecute these Seattle activists to test a strategy to cripple local anti-war groups before they became too big. They believed that charging protest leaders with heavy-duty federal charges would greatly disrupt their ability to organize and likely cripple their organization beyond repair. They were partly right and partly wrong. 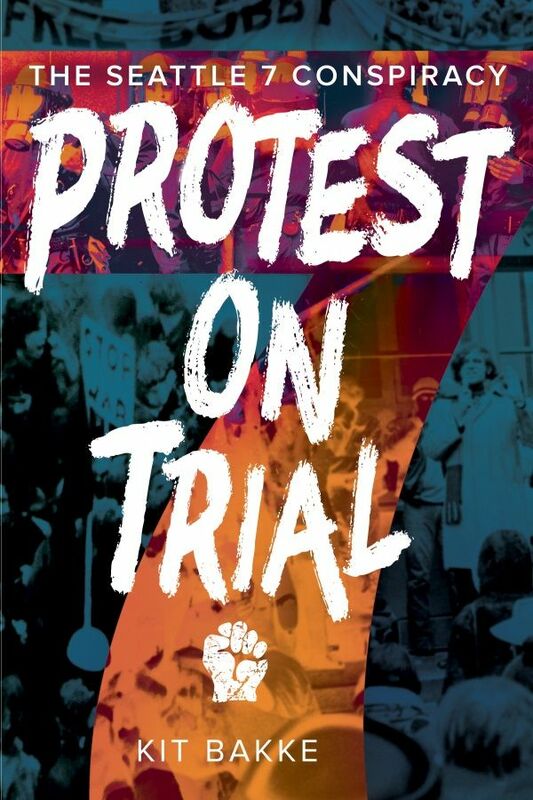 Protest on Trial is a very good read for those who want to know more about Seattle’s radical history through some exciting times and delightfully described characters. It also shows how one must tap into the culture of those you want to organize. For the Seattle 7 it was the youth culture, but the need to deliver your message within a cultural framework, whether it consists of youths or blue-collar workers, was amply demonstrated in our last presidential election.